The REGenerate function means line and DI inputs can be fed through the mic input transformer to inject historic Neve magic to any signal. 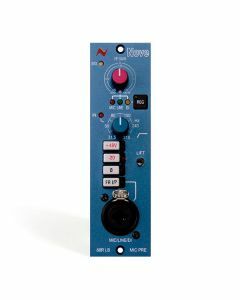 A sweepable high-pass filter can be switched in or out, an intelligent 48v phantom power control features alongside a -20dB pad and phase reversal features for mic, line and DI inputs. A signal presence LED illuminates green from a level of -25dB and red from a level of +26dB whilst a front combi-XLR connector for all inputs eliminates potential ground loops when using unbalanced jack connectors in the front input.